Figure 1. 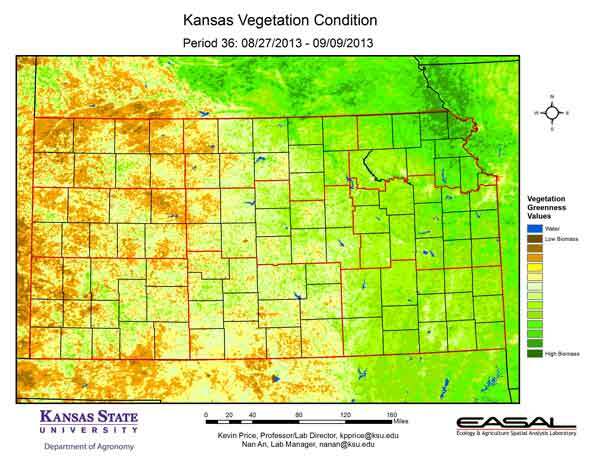 The Vegetation Condition Report for Kansas for August 27 – September 9 from K-State’s Ecology and Agriculture Spatial Analysis Laboratory shows that the area of low photosynthetic activity is increasing in northwest Kansas. This is the region of the state that has had the most area of exceptional drought, and the low rainfall and high temperatures continued to dominate the region during this two-week composite period. Figure 2. 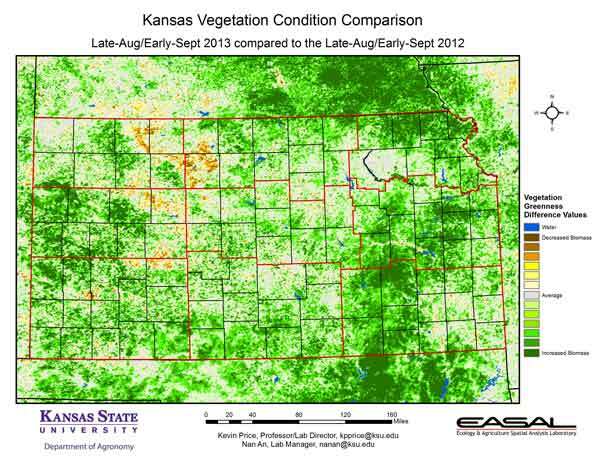 Compared to the previous year at this time for Kansas, the current Vegetation Condition Report for August 27 – September 9 from K-State’s Ecology and Agriculture Spatial Analysis Laboratory shows that while much of the state has greater photosynthetic activity, Rooks County has had a big decrease in biomass productivity. It is important to note that the increase in photosynthetic activity over much of the state is mainly a reflection of how poor production was in 2012. Figure 3. 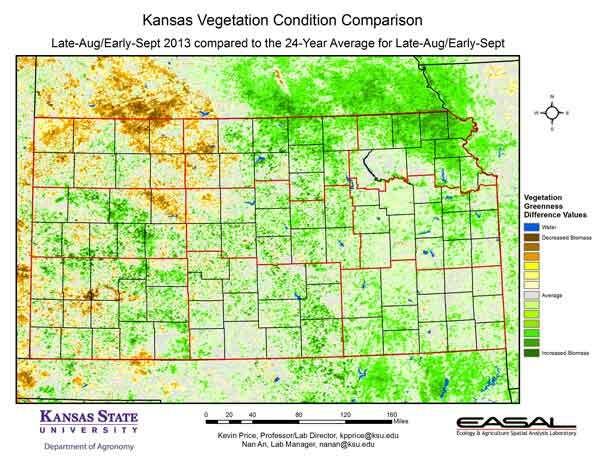 Compared to the 24-year average at this time for Kansas, this year’s Vegetation Condition Report for August 27 – September 9 from K-State’s Ecology and Agriculture Spatial Analysis Laboratory shows that the Northwestern Division has the lowest NDVI values, with Decatur, Norton and Phillips counties having the lowest biomass productivity. In Decatur County, the precipitation for Jan-Aug averaged just 57 percent of normal. Figure 4. 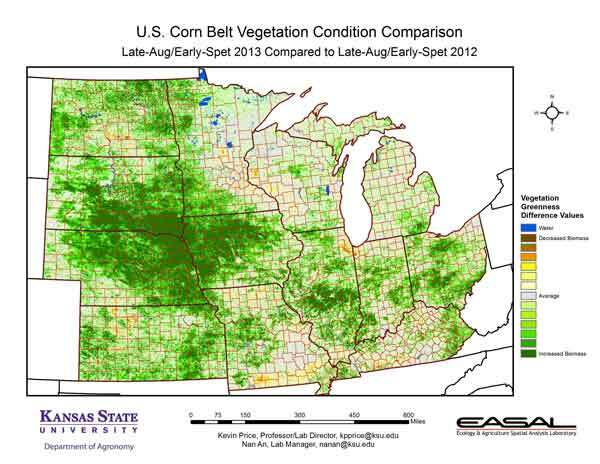 The Vegetation Condition Report for the Corn Belt for August 27 – September 9 from K-State’s Ecology and Agriculture Spatial Analysis Laboratory shows that areas of greatest biomass productivity are in northeastern Nebraska and northwestern Iowa, as well as in northern Wisconsin into the Upper Peninsula of Michigan. This includes areas of late-planted row crops struggling to complete development. In northwestern Iowa, only 53 percent of the corn has reached dent, compared to 99 percent last year. Figure 5. 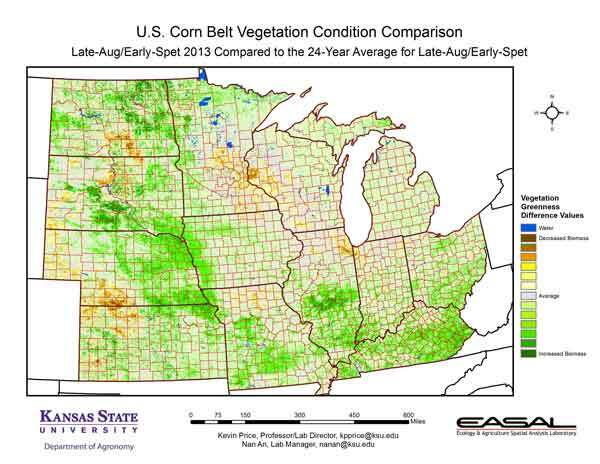 The comparison to last year in the Corn Belt for the period August 27 – September 9 from K-State’s Ecology and Agriculture Spatial Analysis Laboratory shows that photosynthetic activity in Nebraska, South Dakota, and much of Iowa are much higher than last year. This is mainly a reflection of the late development of this year’s crop. In Iowa, 35 percent of the corn is rated good to excellent, while in Nebraska 62 percent of the corn is rated good to excellent. Figure 6. 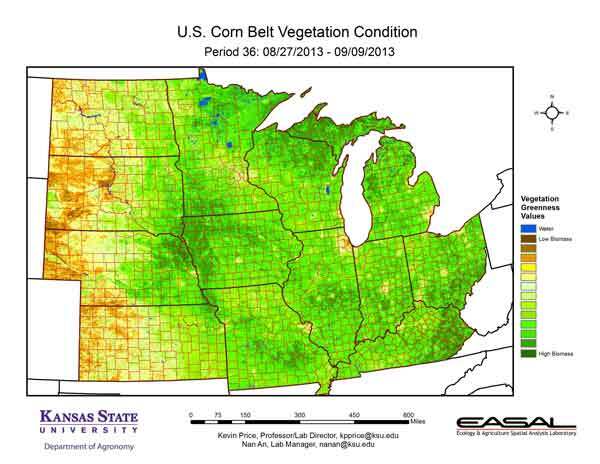 Compared to the 24-year average at this time for the Corn Belt, this year’s Vegetation Condition Report for August 27 – September 9 from K-State’s Ecology and Agriculture Spatial Analysis Laboratory shows that much of the region has near-average biomass productivity. North Dakota has a large area of much-above-average photosynthetic activity. In North Dakota, 58 percent of the pastures are reported in good to excellent condition. Figure 7. 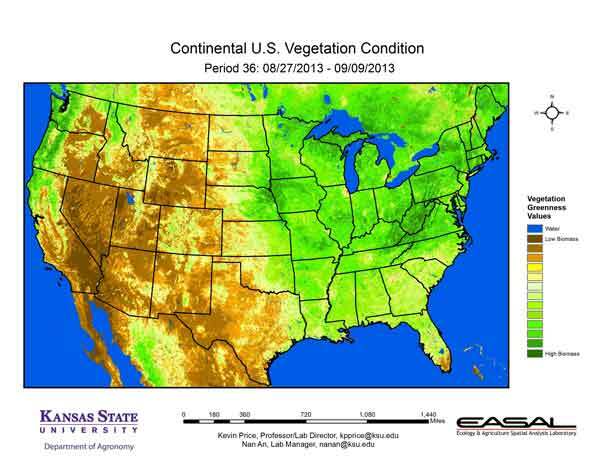 The Vegetation Condition Report for the U.S. for August 27 – September 9 from K-State’s Ecology and Agriculture Spatial Analysis Laboratory shows that photosynthetic activity continues to be high in the eastern half of the U.S., as well as along the Pacific Northwest. NDVI values are particularly high along the Appalachians into northern New England. Figure 8. 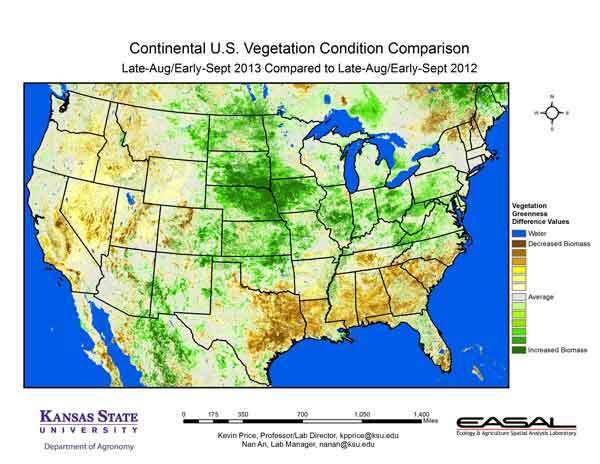 The U.S. comparison to last year at this time for the period August 27 – September 9 from K-State’s Ecology and Agriculture Spatial Analysis Laboratory shows that the biggest decrease in biomass productivity is in the Southeast, from east Texas to the Carolinas, while the Central Plains has the biggest increase in activity. Wetter conditions this year have resulted in some disease problems and harvest delays. Figure 9. 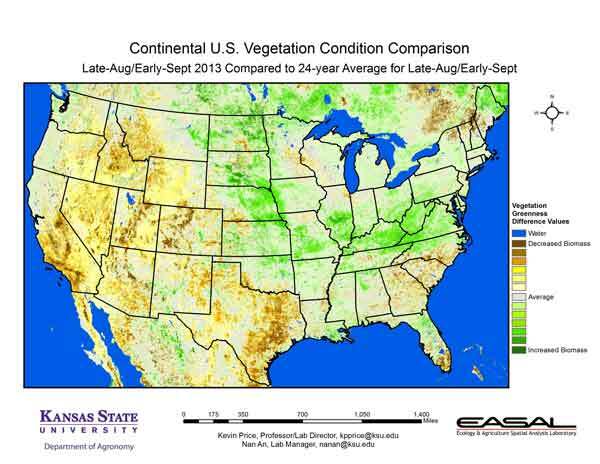 The U.S. comparison to the 24-year average for the period August 27 – September 9 from K-State’s Ecology and Agriculture Spatial Analysis Laboratory shows that biggest area of below-average biomass production continues to be in the W. Extreme drought continues in east Texas, and in Nevada and Utah.